There is nothing like having major elective surgery to focus your mind. When I was preparing my household for when I had my hip replaced I felt and acted as I did before I had my babies! There was this strong need to clean everything in sight, re-arrange cupboards and tidy drawers. This included all daily items I use so that I would be able to reach them without bending too much. And then there was this huge desire to fill the freezer, which I had to clean and reorganise first, I might add! Well, I did bake up a storm as they say, and now I have had my operation and I’m at home recuperating, we are reaping or should I say eating, the benefits! One of the slices in my freezer is a batch of Chocolate Brownies. Which I confess that I modified a cake recipe by adding chocolate chunks and baking the batter in a slice tray. The result was a moist chocolately brownie that you can eat on its own, freeze for a school/work lunch box treat or if you want an easy decadent tasting desert add some warmed berries and mascarpone cream! 1/2 cup coconut sugar (sifted to remove large granules) or honey – preferably raw. • Preheat oven to 350F or 175C. • Line a 23 cm/9 inch x 16cm/6 inch baking tray with parchment/cooking paper. • Melt the butter or oil in a saucepan on low heat. • Stir in the sifted cocoa powder until mixture is smooth and remove from heat. • In a large mixing bowl, beat or whisk the eggs, coconut sugar (or honey), salt, baking powder & vanilla essence together until incorporated well. • Pour cocoa/butter or oil mixture into the egg mixture and mix well. • Add flour and whisk or beat until smooth. • Lastly add your chocolate chunks or chips. • Pour batter into the cake tray. • Bake at for 12-15 minutes depending on your oven. Check after 10 minutes, the Brownies are ready when a skewer/tooth pick inserted comes out with only a few bits of the mixture attached. 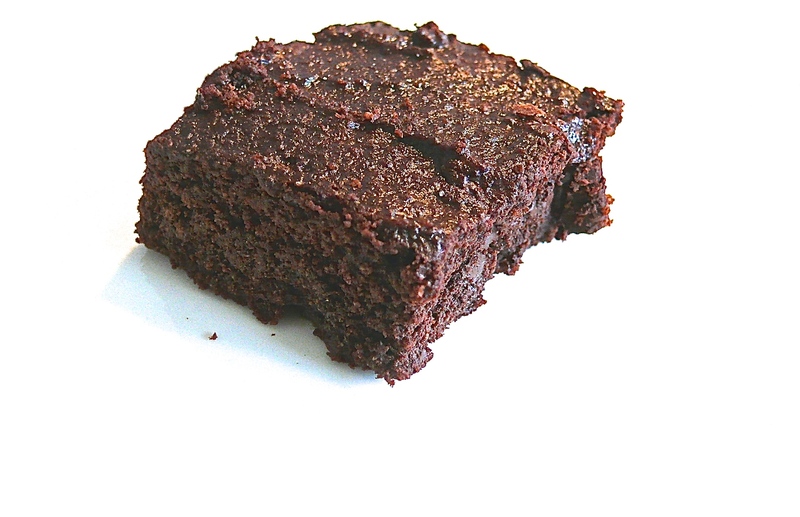 If you bake it too long you won’t get that fudgey Brownie texture – but you will still get a great slice! • Remove from oven, let cool in pan for 5 minutes then carefully remove and cool on a cake rack.